CAPTION: Grand River Technical School graduates receive certificates of completion from GRTS director Jayme Caughron Friday evening during graduation exercises at Gary Dickinson Performing Arts Center. Of the 46 post-high graduates, 41 are entering the workforce, with 31 of them already having a job. Four are continuing their education. Forty-six post-high students of Grand River Technical School received certificates in the school's 48th annual graduation ceremony Friday evening at Gary Dickinson Performing Arts Center. Chillicothe R-2 Superintendent Dr. Roger Barnes welcomed those in attendance and introduced members of the Board of Education. "I congratulate you for having the ambition and drive and motivation to improve your way of life by becoming a highly-skilled technician in your chosen field," Barnes said. "Because you are a current technical education graduate, you possess those highly technical skills that will help you create a better life, a better way of living for you now and in the future." Mike Harrington, instructor of industrial maintenance technology, introduced the evening's guest speaker, Tony Deacons, the Chillicothe plant manager for Mauser, USA (formerly CleanTide Container and IBCNA). Deacons relocated with his family to Chillicothe from Clarkston, Michigan, several years ago. Prior to being named plant manager, Tony worked in various capacities within the same company, including supervisor, shipping and receiving, and general laborer. In his remarks, Deacons told the graduates to believe in themselves, make a future for themselves and create opportunities. "Your opportunity isn't going to be given to you," he said. "You must demand it... You demand it with your work ethic." Work ethic is defined by a person's drive, ambition, attendance and focus, he said. "This is the same drive that got you up every day to complete this program," he said. Deacons told the graduates to be prepared to be judged. "Whether you're returning to a current job or whether you are just entering the workforce, how you apply yourself going forward is how you will be judged," he said. "I say, leave no doubt." A strong work ethic will leave no doubt. "There are two types of employees: one who leaves no doubt and one who only wants a paycheck," Deacons said. "I promise you that if you have that drive, if you have that ambition, that focus and if you apply yourself every day, you cannot go unnoticed... Make your place and create your opportunity." Creating opportunity may not be easy, he noted. "There are going to be days when you ask yourself, Why am I doing this? There will be days when you will want to throw in the towel because there may not be an end in sight," he said. "These are just obstacles. This is part of the sacrifice. Do you quit, or do you drive forward?" Deacons explained that he has been faced with obstacles in the past and will face them in the future. "I will not quit and neither can you; this is your sacrifice; this will define your future." Deacons asked family members, friends and loved ones of the graduates to not only celebrate the students' completion of the program, but to continue to encourage and support the graduates. "There is going to be a day when they will need you to remind them what they are working for, why they made these sacrifices. It's your support and your love that will drive them each and every single day," he said. Likewise, he told the graduates to recognize the sacrifices their loved ones have made for them to get to where there are now. Marla Harrington, financial aid coordinator, announced graduates who maintained perfect attendance. They are: Colt Banks, Brandon Burris, Robert Crouse, Clint Dysart, Cade Ewigman, Anthony Hughes, Bo Hustead, Kerby Psota, Ethan Smith and Andrew Wiedmaier. She also announced students with straight A's. They are Mason Booth, Brandon Burris, Clint Dysart, Cade Ewigman, Bo Hustead and Andrew Wiedmaier. Harrington noted some of the challenges that graduates have made to complete their areas of study. "We know some of you have driven over an hour one way just to come to school every day," she said. "We know that some of you are raising families as you go to school. We know that several of you are working full-time and maintaining a full schedule at school." She congratulated the students for their dedication to their education. are introduced during graduation ceremonies Friday evening. GRTS Assistant Director Adam Wolf presented certificates to the graduates in the following fields of study: auto service technology, computer network administration, computer/networking technology, advanced diesel technology, diesel services technology, building trades, industrial welding, collision technology and industrial maintenance technology. Wolf noted that between 95 and 98 percent of GRTS's post high graduates are placed in jobs or enrolled in additional post-high training and that this year's class was no different. There are 46 graduates, as of Friday evening, in post-high programs, with an additional 26 in the school's emergency medical services program who will graduate later this year. Most of the school's programs have high school students in them from 16 area sending schools. Of the 46 post high graduates, 41 are entering the workforce, with 31 already having jobs; and four are continuing their education, and one is entering the military. Wolf then announced the instructors of the school's programs, and each announced the graduates in their respective areas of study. 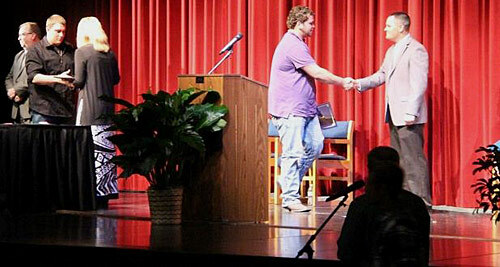 Following the presentation of the certificates to graduates, special awards were presented. GRTS Director Jayme Caughron announced Dr. Neil Nuttall, retiring president of North Central Missouri College, as the recipient of the Outstanding Service Award, and GRTS math instructor Nancy Burtch as the recipient of the Churchill Foundation GRTS Teacher's Scholarship. Grand River Technical School graduates are as follows: Auto Service Technology - Anthony W Kolster, Lathrop; Jeremy A Maudlin, Hamilton; Jordan T Nichols, Cameron; Computer Network Administration - Scott A Anders, New Cambria; Logan Michael Wilson, Chillicothe; Computer Networking Technology - Darron R Baldwin, Albany; Mason L Booth, Ridgeway; Anthony A Sims, Unionville; Advanced Diesel Technology - Anthony Glenn-Hughes, Grain Valley; Eric R. Sallman, Overland Park; Andrew J. Wiedmaier, Cameron; Diesel Services Technology - Brent A Campbell, Braymer; David L. Campbell, Braymer; John T. Campbell, Unionville; Kameran L. Christian, Unionville; Obia D Clark, Eldorado Springs; Robert C Crouse, Trenton; Owen J. Harlan, Unionville; Logan T. Hosier, Overland Park; Ethan M. L. Smith, Princeton; Miles F. Ward, Gilman City; Levi Edward Weese, Chillicothe; Building Trades - Michael E. Anders, New Cambria; Christopher A. Burkin, Galt; Christopher M. Hughes, Grain Valley; Cameron Blake Mitchell, Chillicothe; Brett L. Smith, Purdin; Industrial Welding - Brandon T. Burris, Marceline; Collin E. Donoho, Chillicothe; Cade J. Ewigman, Marceline; Cole L. Green, Triplett; Bo M. Hustead, Marceline; Hunter D. Keller, Chillicothe; Collision Technology - Blake A. Bates, Polo; Hannah Marie Caselman, Chillicothe; Garith Bain Felton, Chillicothe; Clay R. Hall, Pearl, Iowa; Brennen Neal, Linneus; Industrial Maintenance Technology - Colt A. Banks, Cameron; Glenn J. Burnett, Kingston; William Scott Davis, Chillicothe; Clinton A. Dysart, Chillicothe; Carter A. Humphrey, Princeton; Timothy D. Munday, Chillicothe; Christopher J. Myers, Lawson; Kerby P. Psota, Bogard. The graduation ceremony concluded with a prayer by Nancy Burtch and a reception in the foyer of the arts center. A Grand River Technical School technical math instructor, Nancy Burtch, was honored Friday evening with a $4,000 scholarship from the Kenneth F. Churchill and Eugenia M. Churchill Foundation, Inc., presented by GRTS director Jayme Caughron. The Churchill scholarship fund provides scholarships to teachers pursuing degrees and/or certifications in career and technical teacher education programs. It is designed to recognize and support academic/technical excellence and high standards, recognize and retain individuals who demonstrate the potential to become effective teachers, and reward teachers who contribute to student learning "outside the typical classroom" and those who devote time to providing training to members of the local community. To be eligible, teachers must be under contract to teach for GRTS and possess valid state teaching licenses for that period of time, have a proven track record of working with students in the classroom and at shop or clinical sites, and value education and have a strong desire to learn and teach; relate well to diverse students; be passionate, positive, energetic, creative and enthusiastic. Nancy Burtch (left), technical math instructor at Grand River Technical School, was presented the Churchill Foundation GRTS Teacher's Scholarship, as presented by GRTS Director Jayme Caughron (right). C-T Photo / Catherine Stortz Ripley Dr. Neil Nuttall (left), retiring president of North Central Missouri College, is presented the Grand River Technical School's Outstanding Service Award. 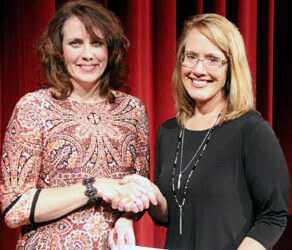 The award was presented by GRTS Director Jayme Caughron (right). GRTS recognizes one supporter of the school each year with the Outstanding Community Service Award during the school's graduation ceremony. The award was established in 1984 to be given annually to one individual who has provided support to the school and its students, and who has donated many hours of service to students and GRTS. This year's award was presented by GRTS Director Jayme Caughron to retiring president of North Central Missouri College, Dr. Neil Nuttall. In making the presentation, Caughron stated that he has served on the Northwest regional and Missouri Workforce Investment Boards and is the legislative liaison for the Missouri Community College Association. He chairs the Northwest Business and Educational P-20 Council and facilitates strategic planning for several educational entities in northwest Missouri. 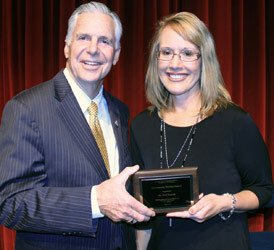 "He has wholeheartedly supported graduates of GRTS as they continued their education at NCMC," Caughron said. "In nearly all of our technical programs, students are able to earn 30 hours of articulated college credit, making it both timely and economical to complete their associate�s degrees." Caughron stated that Nuttall has been supportive of GRTS as the school serves as a technical campus for NCMC, providing opportunities for the school to receive grant funds for equipment and staff professional development. Grand River Technical School will have its graduation program at 7:30 p.m. Friday at Gary Dickinson Performing Arts Center. There are 46 individuals who have completed one of nine programs offered through the school, with the largest class of graduates having completed the diesel services technology program. 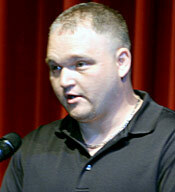 Tony Deacons, plant manager of Mauser USA, will give the graduation address. Marla Harrington, financial aid coordinator, will present the graduates and Adam Wolf, GRTS assistant director will present the certificates. GRS Director Jayme Caughron will announce the recipient of the Outstanding Service Award and present the Churchill Foundation GRTS Teacher's Scholarship.